We all love doggy and kitty kisses, but when they start to develop gum and tooth disease, it could become unpleasant not only for us, but also for them. Dental disease (gingivitis and periodontitis) is a very common disease as it can be quite challenging to keep our fury friends’ teeth sparkly clean as they do not brush and floss as we do (if you are ever curious to what happens if teeth go for years without brushing, you only have to look at your pets teeth!). Research has shown that at the age of 3, 80% of pet’s already have some degree of dental disease. Taking care of our pets teeth, doesn’t only freshen their breath, but also improve’s their quality of life. In a normal mouth, the teeth are clean and white and the gums attach smoothly to the tooth surface. There is no redness or discoloration or tartar. The tooth is bathed in saliva, bacteria and food particles called plaque (colourless film), but if this is brushed away, it never mineralizes into tartar (gritty hard material). 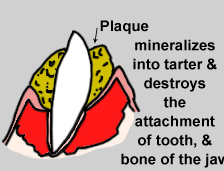 If we do not regularly disinfect our mouths and brush away the plaque, it will also mineralize into tartar. This tartar being solid and gritty, blocks oxygen from bathing the outer tooth and thus changes the nature of the bacteria that can live around the teeth (some nasty bacteria can’t survive when exposed to oxygen, thus making this protective cocoon favourable for their growth). 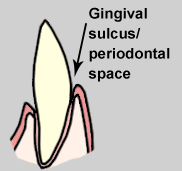 This leads to inflammation and tenderness around the gingival sulcus (space between tooth and gum), causing gingivitis (red, swollen gums). As this progresses, the tartar creates more and more inflammation, start to cover the crown of the tooth and destroy the tissue around the tooth. The tartar accumulate under the gum and start to separate it from the teeth, forming pockets or spaces under the teeth that can foster even more bacterial growth. The gum tissue can even start to recede, exposing the tooth root. 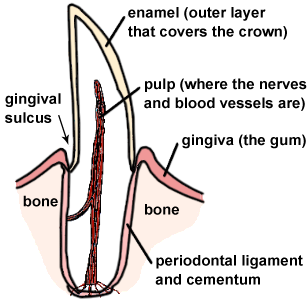 Eventually the attachment between the tooth and bone (jaw socket) is destroyed. This leads to premature tooth loss and even weakening of the jaw bone that can potentially fracture or even disintegrate (a serious problem in toy breeds). 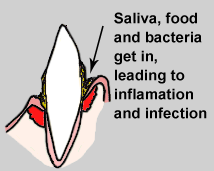 But worse still, the bacteria of the mouth can seed to other areas of the body leading to infection, commonly of the heart valves and kidneys. This condition is serious, but not to worry! Dental disease is preventable and treatable in most pets. BREED – small dog breeds are more prone to have overcrowded (residual baby teeth – whenpuppy teeth don’t fall out) and misaligned teeth that are difficult to keep clean and result in easier tartar build-up. BUT PLEASE, EVEN THOUGH YOU DON’T SEE ANY OF THESE SIGNS YET, IT IS STILL ADVISABLE TO ASK YOUR VETERINARIAN TO DO A DENTAL CHECKUP, as up to 60% of the signs are hidden below the gum line. WHAT CAN WE DO ABOUT DENTAL DISEASE? It’s very important to address dental disease early, as the gingivitis stage are reversible, but once bone loss occur’s, we won’t be able to reverse the process. This is a very important step in controlling and preventing periodontitis in our pets as home dental care is never perfect and periodically tartar must be removed properly and the tooth surface polished and disinfected. It is advisable to clean pets’ teeth every 6-12 months or earlier depending on individual patient’s needs. During this procedure, each patient receives general anaesthesia to ensure proper cleaning and polishing of each tooth and extraction of any diseased or loose teeth. Gross tartar is firstly removed with special instruments, where after the more delicate tartar deposits are removed with a scaling tip. Finally the enamel surface is polished with fine gritty toothpaste to remove any unevenness left by tartar removal. The mouth is then disinfected to decrease the bacterial load. Daily brushing and home care is ideal and needed to control existing gingivitis, but even brushing three times a week can remove most (but unfortunately not all) plaque before it becomes mineralized as tartar. Not all pets are amenable to hands-on oral care and not every one’s schedule allow daily brushing. It’s always good to become familiarized with opening and inspecting your pet’s mouth.Gently lift the lip and look at the teeth, but pay attention to the back teeth (molars) as well. Then open the mouth and look at the inside of the teeth and the tongue. It’s now time for brushing! The fibres of a toothbrush are able to reach the spaces between the teeth and pick out any food deposits under the gum line. Always try to use a pet toothbrush if possible as these are specifically designed for doggy and kitty mouths. BUT NEVER USE HUMAN TOOTHPASTE: these contain foaming agents that are not meant to be swallowed. Animal toothpastes are also flavoured with special flavours like malt and chicken, to enhance compliance. Some animals are not going to allow brushing, especially those with tender gums. In these patients, you can either use dental wipes to wipe of plaque from the tooth surface (but unable to remove food from gum socket) or oral rinses and gels. Chewing on a dental chew like a Greenie@, can substantially decrease the build-up of plaque by up to 69%. Not only does chewing on these products produce saliva with natural occurring enzymes, but they also contain ingredients that prevent mineralization of plaque and helps with bad breath. When using chew treats, it is important to use chews of appropriate sizes to prevent swallowing and choking and even intestinal obstruction. Also remember that pets with diseased teeth, may actually break teeth on hard treats. COW HOOVES AND BONES ARE NOT APPROPRIATE CHEW TREATS AS THESE ARE TOO HARD AND READILY BREAK AND DAMAGE TEETH. 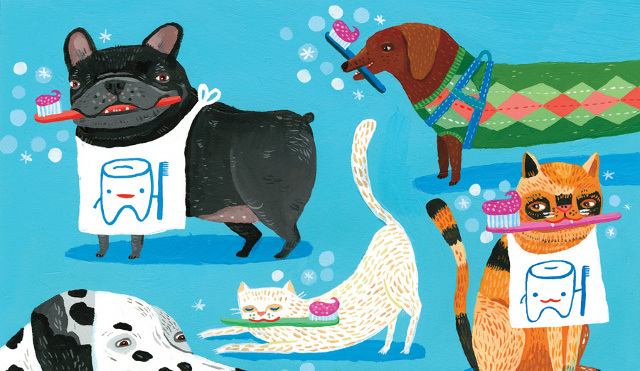 These foods have a larger kibble size, forcing the pet to chew rather than just swallow. They are also high in fibre, which means the food don’t shatter when chewed but instead thetooth sinks into the kibble allowing plaque to be mechanically scrubbed away. It is also important to realize that these food are helpful in cleaning the chewing teeth (molar and premolars) and not the canines or incisors. At the end of the day, it’s never too late to start a dental care plan. By keeping our pets’ mouth’s clean, we not only improve their quality of life but also their general health. Please come and speak to us about your fur baby’s toothy situation and make use of our special Dental health months to keep our pets healthy and happy – and that’s the tooth, the whole tooth and nothing but the tooth.